Photo Writing - Exploring Photography. : Back to the Museum - Lit portraiture on the fly and telling a story. Back to the Museum - Lit portraiture on the fly and telling a story. From the outset I have to admit that I am a fan of Joe McNally, David Hobby and Don Gianatti’s portraiture work using small lights to create intriguing portraits (they don't know who I am from a bar of soap, but have all been quite instrumental in honing my lighting skills and techniques). Obviously working to brief one’s portraits have to actually be useful from a commercial point of view (every photographer would love to create portraits like Sebastião Salgado, but showing an individual in the grittiest of light isn’t necessarily what they are going to want, and remember, THEY are the client). 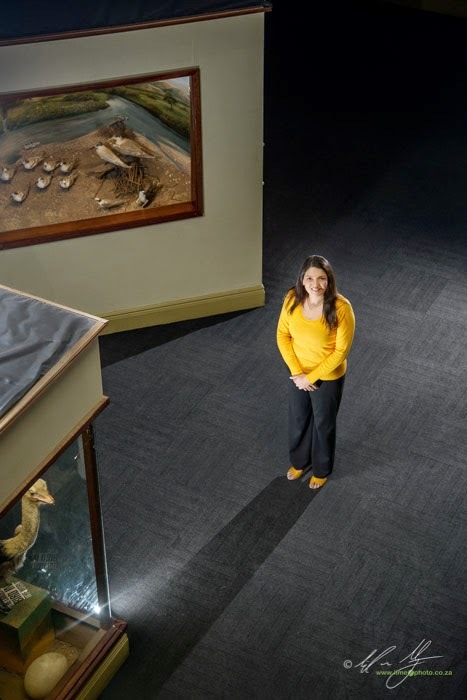 I recently found myself back at Durban’s Natural History Museum to create portraits of several staff members for the upcoming edition of their in-house Thola magazine. In the darkened corridors of the displays I once again found myself pulling tricks and ideas from the three photographers mentioned above. These three images are worth discussing a little. The first was actually one of the last images taken for the day. Everyone loves the T-Rex exhibit at the museum, but I needed to get an image that was slightly different to the usual, “stand next to the dinosaur and smile” shot (like this one taken last year). 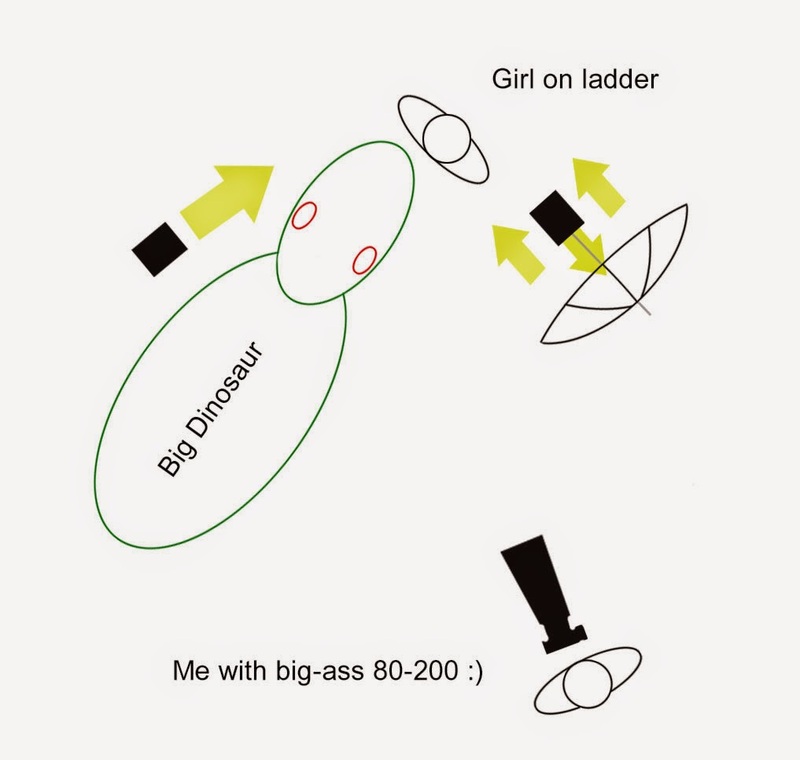 For this we scrounged a large A-frame ladder and had Zama, climb to the top and cling as close as possible to the opened maw of the Tyrannosaurus. It worked, and we got a series of images of her fooling about in front of the giant teeth. Getting the light was interesting too. I had my assistant Claire hold a 1/2 CTO gelled strobe bouncing into an umbrella at the end of a fully extended 3m light stand (the exhibit is rather large and the ladder pretty high). This was placed high up and to camera right giving a fairly soft broad light to Zama. 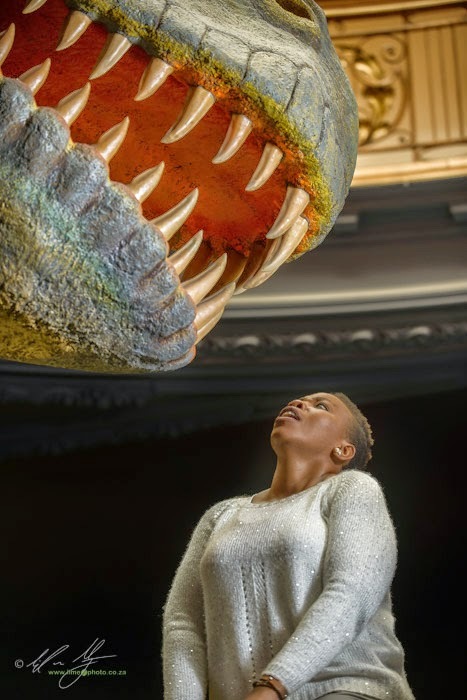 To light the inside of the T-Rex’s mouth and give a bit of definition to the opposing side of Zama’s face I had another strobe firing bare, but feathered away from Zama slightly on the opposite side of the dinosaur to myself (also gelled but with a full CTO). 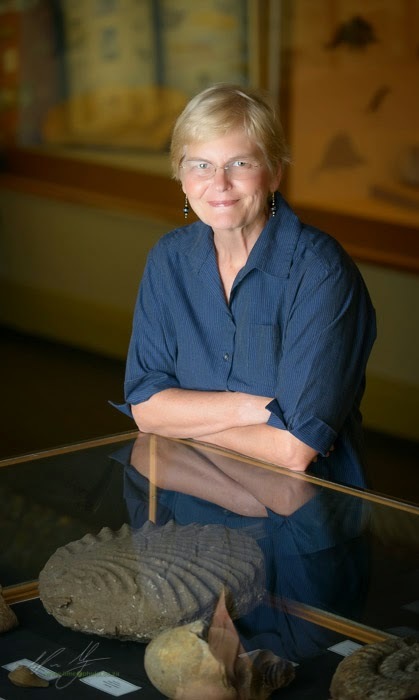 Still with the ladder, and close to the T-Rex exhibit, I photographed the curator of the fossils exhibits. This time I was on the ladder. The idea was to photograph down slightly so that I could get a better angle to show one of the large fossil trilobites in the collection. The problem is that going lower creates a huge reflective surface of the glass. By adding this angle to the image the reflective glass certainly reflects the curator, but also allows the camera to see through the glass. Better yet, the large 1m Octobox that I was using didn't reflect either. Then there's the oft repeated advice - Do not photograph a woman from below unless you are absolutely sure about what you are doing! Women tend to look younger and more feminine if photographed from slightly above (you don't have to take this to extremes though). The last photograph here was taken a few days later and is of the director of the Natural History Museum, Alison Reuters. For this image I wanted to place her in the museum so that the viewer could automatically see a link between the museum and her. In one of the galleries, there is a huge opening to the level above, beneath the ceiling dome of the City Hall itself. I made my way up to this level with my camera and an 80-200mm f2.8 lens. Down below I had a makeshift assistant (one of the museum staff) hold a strobe in umbrella to camera left and up above the display visible in frame. This gave me short lighting, but created a strong shadow under Alison's chin. To compensate for this I placed a small bare flash underneath the display. It's visible here. I decided to keep it visible as it looks like it's there lighting up the ostrich display rather than Alison, which I sort of liked. Finally I placed a third strobe behind Alison and zoomed in to the back of her head to create separation between her and the dark background. I left the background dark as I wanted to create the impression that the gallery could potentially be enormous, and it's a very useful corner to place copy (text) in, bearing in mind that the images were being shot for potential use in a magazine. In each of the examples above I started with the premise that the lighting should try to help me tell the story. Lighting needs to be more than just a positioning of strobes that go off randomly. They should compliment what it is you are trying to do with the image itself. For this reason it's good to know what the final output of the image is likely to be. Often my clients are wanting an image that can be used on the web, in print and in posters. Sadly not all images work equally well in each of these media, but knowing what the primary usage is intended to be, goes a long way in helping the photographer create an image that melds with the intended use and tells a story. Very nice work. Small and light flashes are indeed becoming a proven method of professional lighting.